In 1925, when he volunteered to defend John Scopes' right to teach evolution, Clarence Darrow had already reached the top of his profession. The year before, in a sensational trial in Chicago, he saved the child-killers Nathan Leopold and Richard Loeb from the death penalty. The Scopes trial would bring him even greater notoriety. Clarence Darrow grew up in an unconventional household. His father was a carpenter and part-time undertaker in the little town of Kinsman, Ohio. He was also an atheist. "The fact that my father was a heretic always put him on the defensive," Darrow later wrote. "We children thought it was only right and loyal that we should defend his cause." After practicing law in a small Ohio town, Darrow moved his young family to Chicago. In five short years he was general attorney for the Chicago and Northwestern Railway. He was making lots of money representing the powerful railroad, but he yearned to do something important with his life. When the workers of the Pullman Railway Company went on strike in 1894, Darrow resigned his job to defend them against the railroad. Over the next few years, he defended strikers, labor leaders and anarchists. By the turn of the century he was a celebrity of the radical left. In 1912 Darrow took on a case that almost destroyed his career when he defended two union officials accused of murder in the dynamiting of the Los Angeles Times building. Before the trial was over, Darrow himself was under attack — for bribing the jury. Though he was not found guilty, his reputation would never be the same. "He was devastated," says biographer Kevin Tierney, "and I think it's fair to say that he had a kind of nervous breakdown. From then on he never got any employment from organized labor. His career as a union lawyer came to an end and he became a criminal defense lawyer." 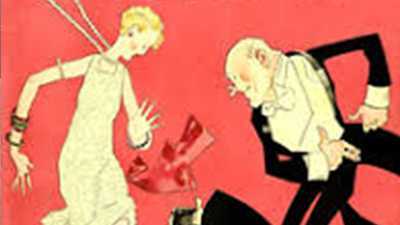 By the 1920s Darrow was back on top as the most famous trial attorney in America, a persuasive speaker who earned up to a quarter million dollars a case. But it wasn't the law that excited him — it was the great contest over ideas. Darrow had supported the populist candidate William Jennings Bryan in his first presidential campaign. But he opposed Bryan's religious beliefs. For years Darrow had been trying to engage Bryan in a public debate over science and religion. 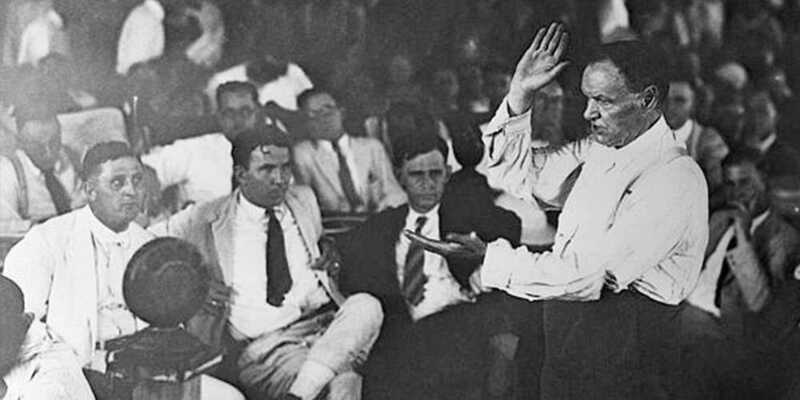 He believed the Scopes trial would be the perfect platform for that debate. In the courtroom, Darrow faced an uphill battle. Judge John T. Raulston carried a Bible and began each day with a prayer. He refused to overturn the anti-evolution law and would not allow scientists to testify in favor of evolution. Frustrated, Darrow came up with an unorthodox plan. On the seventh day of the trial, on a platform outside the Dayton, Tennesseee courthouse, he called William Jennings Bryan to the stand as an expert on the Bible. Before a crowd of two thousand people, Darrow tried to trap Bryan into admitting the absurdity of his belief in Genesis. The debate escalated into a furious argument over the meaning of religion. By the time the judge called a halt, the two men were shaking their fists at one another. The next day the national press announced that Clarence Darrow had exposed Bryan's "mindless" belief in Biblical scripture. But many people called Darrow's inquisition "a thing of immense cruelty." When Bryan died five days after the Scopes trial ended, some even accused Darrow of murder. He countered that Bryan had died of "a busted belly." In 1927 Darrow and the American Civil Liberties Union appealed the case before the Tennessee Supreme Court. John Scopes' conviction was overturned on a technicality — but the anti-evolution law remained on the books for many more years. Darrow continued to try high profile cases into his 70s. He died in 1938 at the age of 81. At his request, friends scattered his ashes over a bridge in Chicago's Jackson Park. When the state of Tennessee passed a law making it a crime to teach Darwin's theory of evolution in public schools, Roger Baldwin saw it as an opportunity and became executive director of the American Civil Liberties Union, a fledgling organization devoted to individual rights. 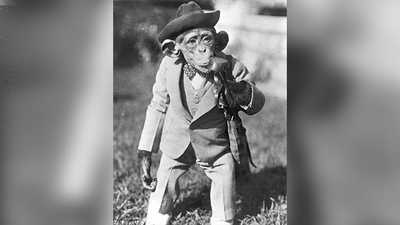 The Scopes trial was a signature event of the Jazz Age. It had that "ballyhoo" spirit so typical of the 1920s. 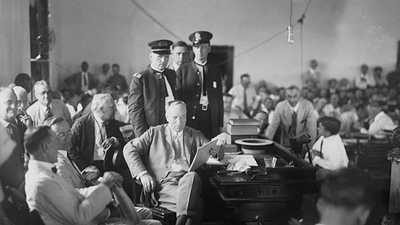 In the Leopold and Loeb trial of 1924, attorney Clarence Darrow achieved what many thought impossible. He saved the lives of two cold-blooded child-killers with the power of a speech.